Congratulations to the 2013 Annual Chamber Award Winners! 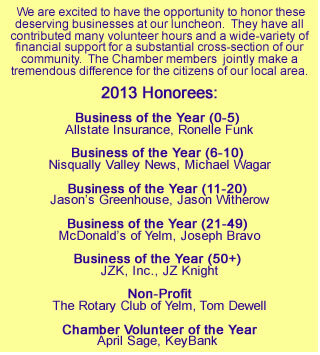 The following Chamber members will be honored at the Tuesday, December 10th Luncheon Forum! We are excited to have the opportunity to honor these deserving businesses at our luncheon. They have all contributed many volunteer hours and a wide-variety of financial support for a substantial cross-section of our community. The Chamber members jointly make a tremendous difference for the citizens of our local area.